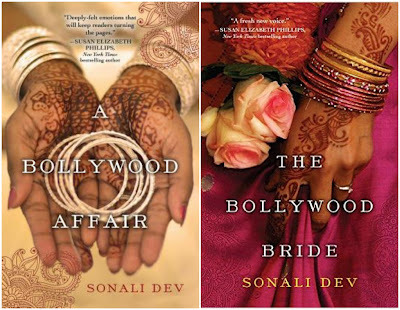 Award winning author, Sonali Dev, writes Bollywood-style love stories that let her explore issues faced by women around the world while still indulging her faith in a happily ever after. 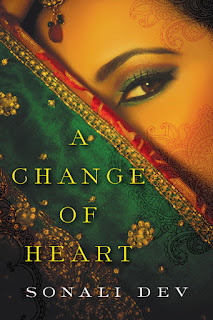 Sonali’s novels have been on Library Journal, NPR, Washington Post and Kirkus Best Books lists. She won the American Library Association’s award for best romance in 2014, is a RITA Finalist, RT Reviewer Choice Award Nominee, and winner of the RT Seal of Excellence. 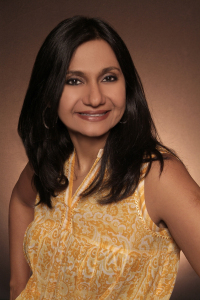 Sonali lives in the Chicago suburbs with her very patient and often amused husband and two teens who demand both patience and humor, and the world’s most perfect dog. 1. Can you tell a bit about yourself? It’s so strange to have someone ask me this, because, you know, I’ve only spent half my life interviewing myself in front of mirrors, in cars, and in the shower. And now I can’t seem to recall anything clever to say about myself. Today was my firstborn’s last first day of high school, so I guess I’ll start with my most challenging persona right now, and that’s being a mom to a seventeen year old and a fifteen year old. (Yeah, I know, fun times!). Add to this the fact that I was born in India many (many) years ago, where school and childhood were entirely different. Except for the fact that even back then I had opinions about everything, and expressing them was my favorite pastime. Which translated directly into writing everything down-- a notebook is a really good listener, you know. So, I’ve basically written all my life. As for hobbies, I could spend all the time I have left over after writing split evenly between reading and dancing. But of course I don’t, because I have the quintessential big fat (not to mention adorable) extended Indian family that fills up my hours and days and makes my life a wonderful and very busy place. 2. You write stories with a Bollywood Beat, what’s so fascinating about Bollywood? To me Bollywood is a two pronged concept, one cultural and the other stylistic. Culturally, it’s the popular face of stories centered around Indians and the Indian state of mind — which is essentially as rich a background as you could find for any story, with a history that spans millennia, a culture that holds within itself hundreds of sub-cultures, the meeting and melding of the eastern and the western, the opulent and the wretched. And against this backdrop we have familial bonds that are so tight they have the power to stifle the life out of you as much as yank you back from the edge of tragedy. As for style, to me the 'Bollywood style' is reminiscent of the large sweeping family sagas Bollywood tends to make. A wide-angled shot of what I see as the essence of being Indian. It’s the dramatic, just this side of melodramatic. It’s families that have no boundaries, no concept of privacy, love that makes choruses burst in your head. It’s beautiful people in beautiful places, but also the smell of the most wretched sewers. It hops around the world but is tied to the traditions of an ancient land. It’s the clash of the oldest culture in the world warring with the most modern values. Whether you enjoy huge sweeping stories about ordinary people or ordinary stories about larger than life people, how can these stories not appeal? At a personal level, it’s about writing what I know. This world is who I am, it’s the people I grew up with in the worlds I inhabit. It’s the reality I’ve seen, but on steroids. As for the Bollywood part, I was raised on a staple of both Bollywood and Hollywood films and I have friends and family who work in the film industry, so it is a world I feel very comfortable with and not in the least bit awed by. 3. You write international stories, set in multiple countries and you’ve traveled the world yourself. In what way does this traveling inspire your stories? To me setting is intrinsic to a story. I think of it as a character in my books. 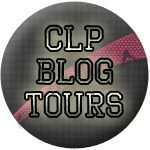 Where characters are from and where the story plays out defines the culture of the story and the characters and the culture of the story influences not just the mood but also the choices the characters make. When I travel I get to actually experience the textures, colors, history that makes up places and when I write scenes those experiences fuel the details. Sometimes being in a place sparks a scene, sometimes being in a place sparks an entire story. 4. Can you describe both Nic and Jess in six words each? 5. You combine several genres into one story. What do you like best about versatile stories? I grew up reading mainstream fiction by Jeffrey Archer, Sydney Sheldon, Eric Segal, Ken Follet, Judith Krantz and those stories were just stories. As a reader I never really thought about the genre or expected anything specific from them except a ton of emotion, excitement and a good satisfying ending. They had large characters with intricate relationships painted on large canvases and I loved that. But I also love the hero-heroine-relationship focus of romances and the promise of a hopeful and happy ending. So, I think it’s just natural for me to combine those things and to gravitate toward these stories that focus on a relationship but set it within a larger more complex story. 6. The covers of your books are stunning. Can you tell a bit more about them and are you part of the creating process? My editor and cover artist get complete credit for my lovely covers. I do give them cover concept sheets with all the visuals that represent my story for me and they take it and make magic with it. 7. When/How did you know you wanted to become an author? I’m one of those writers who didn’t discover her love for writing suddenly or serendipitously. I’ve written and loved to write for as long as I can remember. But making a life as a writer was one of those dreams that somehow always seemed like a pie in the sky. Consequently I went to architectural school so I could have a ‘real’ career, I continued to pursue my ‘hobby’. But the need to write was so strong I found myself quitting my job at my architectural firm to work for an architectural magazine within months of graduating. So, really, for me the true journey was going from business writing and journalism to fiction. And that flip happened over the phone when I was talking to my best friend who is a movie producer. She was complaining about the scripts she’d been reading and we both said, ‘Well, how hard can it be to write a good movie?’ Famous last words, right? I wrote my first script for her within a month and then wrote several after that. None of these ever got made into movies (answering our ridiculously arrogant question with all the delicacy of a tight slap). But once I’d caught the fiction bug I couldn’t shake it off. The high of creating characters and putting them through the ringer and watching them triumph was a drug like no other. 8. What does your writing routine look like? I write full time now. My kids are in high school, so daily writing time isn't in conflict anymore. I write through the day. I take a break when the kids get home and then I continue to write when they go off to do their thing. My main struggle is separating the author tasks from writing and finding time to put the writing first. I've also become a progressively more and more diligent list maker and goal setter. Having all I need to get done written down helps me manage my time. Nikhil has lost everything. He was happily married to Jen, he loved his work and life was good. Until one day Jen was killed. She worked for Doctors Without Borders and discovered an organ transplant ring. She gathered proof, but before she could do anything with it she was dead. Nic is now an alcoholic who works as a doctor on a cruise ship. That's where he meets Jess. Jess looks a bit like Jen and tells Nic she has Jen's heart. She's at the ship to give him a message from Jen, but is that really what she's doing there? Sonali Dev writes about some serious topics in an honest and empathic way. Some of the scenes are a bit shocking and heartbreaking to read. I had tears in my eyes when I read about the things that are being done to women. It gives A Change of Heart a serious nature. The combination of terrible crimes with awful incidents and sweet romance is making this novel gripping, moving and intriguing. 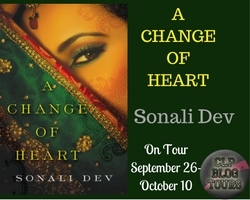 I enjoyed reading this fascinating book and would definitely like to try more stories by Sonali Dev. Two very lucky winners will receive a copy of A Bollywood Affair and The Bollywood Bride in their format of choice.